19.-21. August 2007: Participation at the swisspo trade fair in Zürich, Switzerland. Booth E24. 19.-22. Juillet 2007: Participation at the OutDoor trade fair in Friedrichshafen, Germany. Hall B3, Booth 310. 10.-14. 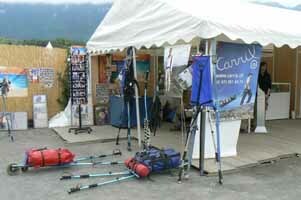 July 2007: Participation at the "Festival international d'Escalade" in Chamonix, France. 17.-20. May 2007: Presentation at our booth at the "3ème Festival International de la Randonnée Eldorando." 30.-31. March and 1st April 2007: Presentation at the "Salon des randonnées," in Paris. Booth Au Vieux Campeur. 23.-26. July 2006: We will participate at the OutDoor trade fair in Friedrichshafen, Germany. 25.-28. May 2006: Presentation at our booth at the "2ème Festival International de la Randonnée Eldorando." 31.03.-02.04. 2006: Presentation at the "Salon de la randonnée, des loisirs et des sports" in Paris. Booth Au Vieux Campeur. 22.-25. 7. 2004: We will participate at the OutDoor trade fair in Friedrichshafen, Germany. 26.03.-28.03. 2004: Presentation at the "Salon de la randonnée, des loisirs et des sports" in Paris. Booth B32. 1.-4.02. 2004: We will be at the ISPO (International sports exhibition) in Munich. November: Carrix has been selected and will be presented as an innovation at the ISPO in Munich. September: Josée and Claude are back from Saint James of Compostelle. Read the report. Summer, autumn 2003: Delémont (Switzerland) -Saint James of Compostelle. Read the report.